When you have a tattoo that you regret, it’s natural that you want it removed quickly and effectively. But sometimes the results aren’t as impressive as you were hoping for. Here are ten reasons why your laser tattoo removal might not be working as well as you expected. For effective tattoo removal, the laser used has to be powerful enough to break down ink pigments in the quickest amount of time possible. Many of the standard lasers used are just not powerful enough and don’t break up the ink enough to achieve the desired results. More modern lasers such as the RevLite Nd:YAG and PicoSure picosecond laser, are far more likely to remove your unwanted tattoo completely and quickly without causing any unwanted side effects such as burning or scarring. Nd:YAG lasers such as the RevLite, use heat (thermal energy) to shatter the ink. Too much heat however, can damage the skin. The PicoSure laser uses a shockwave effect so not only is the ink broken down into particles much smaller than other lasers are capable of, it causes much less trauma to the skin because of its picosecond (very short) pulse. Using less heat and only targeting the ink means less skin damage. The ink shatters on impact when treated by the laser, allowing the body to dispose of the small particles through the lymphatic system. Different laser wavelengths are needed to remove different colours of ink. Dark colours are easier to remove than lighter ones, with black being the easiest of all – a 1064nm laser is the right choice for removing an all-black tattoo. However, this is the only laser on offer at many tattoo removal clinics, and it isn’t effective for removing coloured tattoos. Blue and green inks tend to be particularly difficult to break down – a 694nm laser is the most effective for removing these colours, while red and orange inks require a 532nm laser. 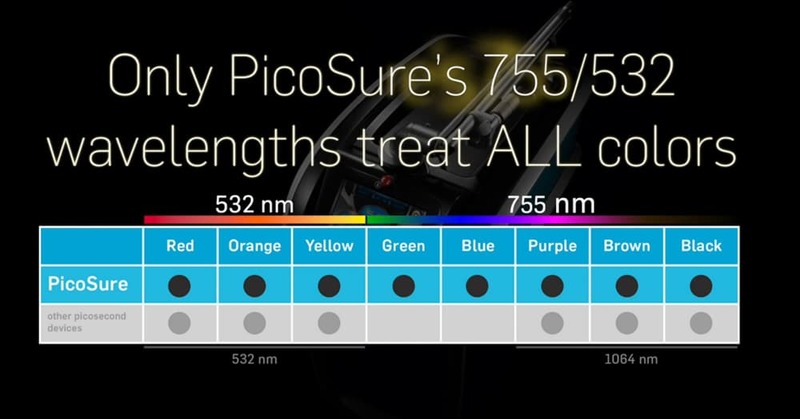 So if you have multicoloured tattoos your best option would be to choose a clinic with the gold standard PicoSure laser, which can an treat all colours. 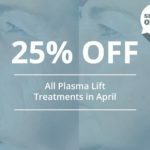 The skill and experience of your laser technician have a profound impact on the success of your treatment, as well as ensuring your skin is protected. If a tattoo isn’t responding well to treatment, an inexperienced or poorly trained technician may keep treating the same spot for too long. 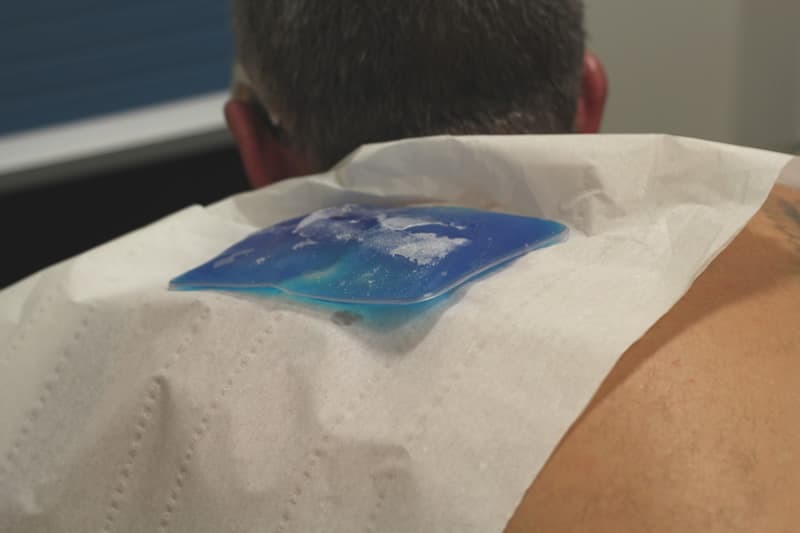 This won’t remove the tattoo any faster or more efficiently – it is actually highly dangerous as it causes heat to build up in the skin, resulting in burns and scars. An experienced, qualified technician will apply the correct amount of laser pulses over the area for safe and effective removal. As laser treatment causes heat to build up in the skin, it is essential that the skin is cooled immediately after each session to ensure all excess heat is removed and prevent the skin from burning. You can also assist the healing of your skin by taking a number of precautions for 48 hours after each session – try to avoid getting the area too hot or wet, wear loose clothing and don’t participate in activities such as contact sports that could result in skin damage. Cosmetics and perfumes should not be used on the treated area. Read more about laser tattoo removal aftercare. Tattoo removal treatments should be spaced at least six weeks apart if you are treating the same area of skin. Any less than this will not give your skin sufficient time to recover from the previous treatment. Lasering it again too quickly is likely to cause damage. Read more about laser tattoo removal recovery time. 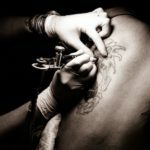 The positioning of your tattoo on your body plays a major part in how effectively it can be removed. The face, neck and back all have high blood and lymph node counts, which make tattoo removal easier. Good rates of success can also be seen on the arms and legs. However, the further down your body your tattoo is, the harder it will generally be to remove. The older your tattoo, the more easily it can generally be removed with laser treatment. Tattoos tend to fade over time. This makes older ink pigment easier to break down with a laser, so an old tattoo will take fewer sessions to remove than a more recent one. What makes tattoos permanent is the fact that the ink penetrates the second layer of skin – the dermis – which is then protected by the epidermis, the outer layer. The further into the dermis the ink has penetrated, the harder it is to remove. 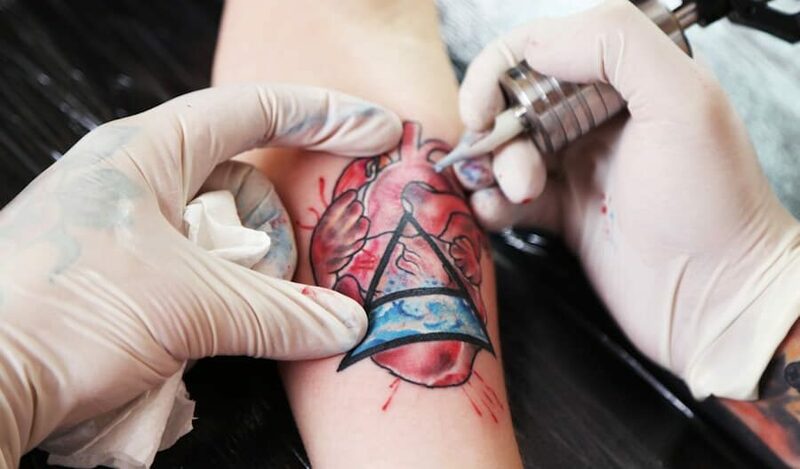 This is why high-quality professional tattoos often take longer to remove than amateur efforts, as professional tattoo artists will penetrate the dermis more deeply and use more ink. Lifestyle factors can also play a huge part in the effectiveness of your tattoo removal treatment – smoking in particular is known to make tattoo removal take a lot longer. Research shows that if you smoke, you are 70 percent less likely to see an effective tattoo removal over a ten session treatment. If you are undergoing laser tattoo removal treatment, it is highly recommended that you avoid exposure to the sun before, during and after your treatment. This is because tattoo removal becomes more difficult if your skin is tanned, and laser treatment cannot be performed at all on burnt skin. If you absolutely can’t avoid exposure to the sun, try not to stay in it for longer than ten minutes at a time, and keep a loose covering over the area of your skin that is being treated. Read more about sun exposure laser tattoo removal. Looking for a reputable laser tattoo removal clinic? With almost 40 years’ experience, Andrea Catton Laser Clinic is the UK’s most trusted name in laser tattoo removal. 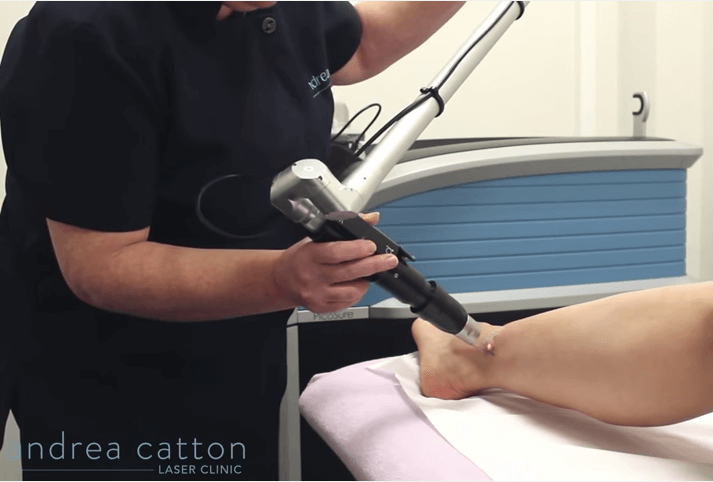 Andrea, a highly trained and qualified technician, is a member of the British Medical Laser Association, and offers treatment with the most highly advanced and powerful laser machines including the PicoSure and the RevLite. Our results speak for themselves, and you can find out more about what our clients have to say here.